Too painful to swallow, too sick to eat — it’s a sore throat that feels worse than normal. Your first thoughts turn to strep throat. A rapid strep test in your doctor’s office is a quick method of confirming your suspicions. Viruses cause most sore throats. However, strep throat is an infection caused by the Group A streptococcus bacteria. The infection occurs in the throat and tonsils. The germ spreads through the tiny spray that comes from an infected person’s cough or sneeze. Once you get the germ, symptoms usually appear within two to five days. Plenty of adults get strep throat. However, it is most common in children between the ages of 5 and 15. If you suspect you or your child have strep throat, don’t put off seeing your doctor. Your doctor will look at the inside of your or your child’s throat using a tongue depressor and flashlight. Physical signs of strep throat include redness, as well as white or yellow spots on the tonsils. If you have strep throat, you also may have swollen glands in your neck. Your doctor will place his hands around your neck to feel for swelling. Your doctor will check your temperature (a fever of 101 degrees or more is typical with the strep infection). He or she will ask you if you have experienced chills, headache, loss of appetite, nausea, a rash, or an overall feeling of illness, as these are also common symptoms. 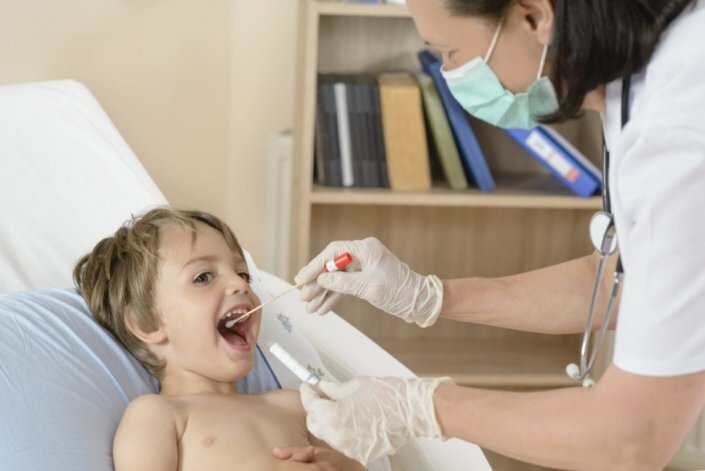 Test confirmation: After reviewing your physical signs and symptoms of strep throat, your doctor may perform a rapid strep test (also called a rapid antigen test). A rapid strep test is done in the doctor’s office during your visit. It involves sampling the bacteria from the back of your throat and tonsils. The doctor will insert a long, sterile cotton swab in your mouth and rub the back of your throat and tonsils to collect a bacteria sample. Swabbing is quick and painless. However, the procedure can make you gag. If your child is being swabbed for strep throat, encourage him or her to relax and sit still to make the procedure go smoothly. Most people react with little more than a cough after the procedure. The sample then undergoes rapid testing in the office while you wait for the results. The wait may take 7 to 15 minutes to find out if you test positive or negative for the strep infection. If the test is negative for strep bacteria, your doctor will give you tips on how to ease the pain of a sore throat (see treatment). If the results are negative, but all physical signs and symptoms point to an infection, your doctor may send the sample to an outside lab for additional testing. It could take up to two days to get the results. If the test is positive for the strep infection, your doctor will prescribe an antibiotic to kill the bacteria. If your symptoms don’t improve within 24 to 48 hours after starting your medicine, call your doctor. You can continue to spread the infection to others during the first 24 to 48 hours of antibiotic use. Adults and children with strep throat should stay home from work, school, and daycare during that time. Replace your or your child’s toothbrush after the first few days of starting antibiotics. The infection can survive on your toothbrush and re-infect you or another family member if toothbrushes are kept together. If you or your child has strep throat repeatedly, see your doctor. One of you may be a carrier. A carrier has strep in his or her throat, but shows no signs of illness. Treating the carrier can keep others in your family from getting the infection. If your rapid strep test comes back as positive for the infection, it could be a false positive. This type of result occurs more often when you have a fever and other strep throat symptoms. A rapid strep test will not find other causes of a sore throat. Don’t share food, drink, or utensils with someone who has the strep throat infection. That’s good advice for any type of sore throat or cold symptoms. How can I tell if my child’s sore throat is bad enough to see a doctor? If a rapid strep test comes back as positive, how would your or your doctor know if it’s a false positive? Can you choose to have your tonsils taken out as a preventive move to avoid strep throat? Where does a strep throat rash appear on your body?